This one made for girl's is set to hit stores in February. 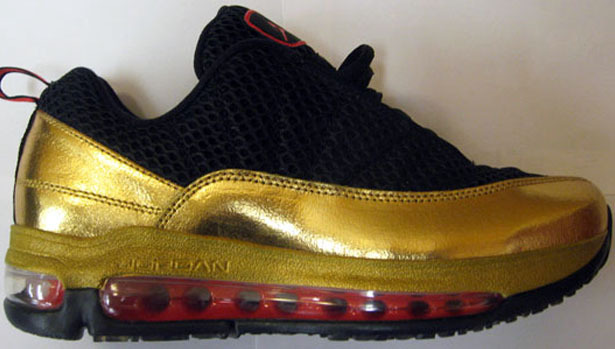 Not to be outdone by the guys, the ladies get some love from the Jordan x Air Max CMFT line in 2011. This all new colorway of the Jordan CMFT Max Air 12 was inspired by the original metallic gold/varsity red-white-black Air Max '97. It features a black mesh upper with gold patent leather. Hits of crimson red are found on the tongue tag, heel tab and max air unit. These are set to release in kid's sizes from gradeschool all the way down to toddler's hard bottoms. Expect these to hit stores in the beginning of February alongside the men's white/metallic silver-french blue colorway.